In conventional tillage (left), a winter rye cover crop has been mixed with the soil, while in strip tillage (right), the rye residue is left on the soil surface. (David Bosch, D3495-1). A young peanut crop growing in a strip-tilled field. 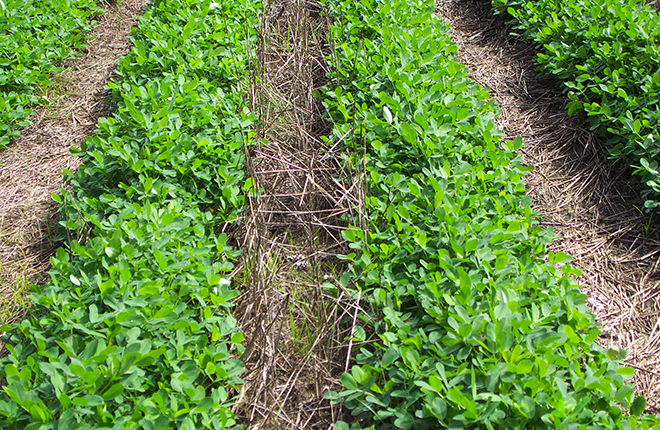 Residue between the rows of peanut reduces erosion and increases water infiltration. (David Bosch, D3496-1). Soil quality is a major issue in the southeastern United States because the sandy, eroded soils there have few of the nutrients and organic matter that crops need. Moreover, climate change is expected to make matters worse, bringing more intense rainstorms that will increase runoff and rob the land of even more nutrient-rich soil. Agricultural Research Service scientists in Tifton, Georgia, are providing guidance to growers on how to maintain soil quality in the face of climatic changes with a study comparing runoff and sediment losses from two common tillage systems. “Climate change could affect soil quality for years to come, and we need to prepare for it,” says Dinku Endale, an agricultural engineer at the ARS Southeast Watershed Research Laboratory. Endale and colleagues David Bosch, hydraulic engineer; Thomas Potter, chemist; and Timothy Strickland, research leader, collected runoff from experimental plots rotated between peanut and cotton crops that were either conventionally tilled or strip-tilled prior to planting. Conventional tillage mixes all crop residues into the soil, while strip tillage does so only in narrow 4- to 6-inch-wide strips where the seeds are planted. The remaining area is left undisturbed so that cover crop residues remain on the surface to protect the soil from water and wind erosion. The focus on strip tillage comes at a critical time. 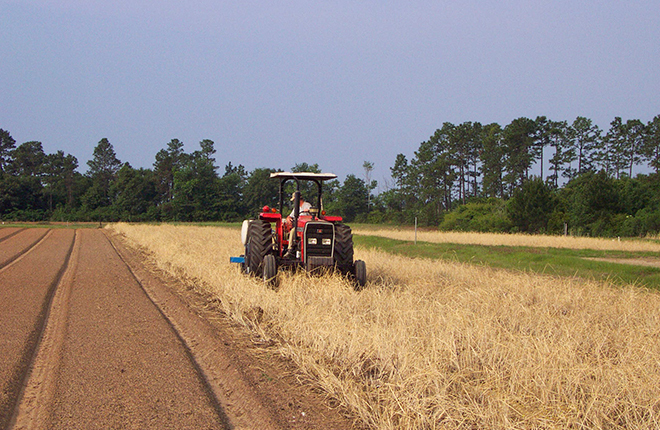 Many farmers in the Southeast began using strip tillage in the 1990s. But the increased prevalence of herbicide-resistant weeds has prompted some farmers to revert back to conventional tillage as a mechanical weed control strategy. The researchers used rye as a winter cover crop to protect the soil, utilize nutrients remaining from the previous cropping season, and increase organic matter. They planted rye in the fall and killed it in the spring with glyphosate in all plots. The research was conducted from 2000 to 2009, which included years with severe drought and heavy rainfall. The results provide a clear picture of the advantages of strip tillage. About 20 percent of the rain on conventionally tilled plots became direct surface runoff. That compared with only 12 percent from the strip-tilled plots. The sediment mass carried in the runoff from strip-tilled plots was reduced by 87 percent, compared to sediment from the conventionally tilled plots. Sediment losses also exceeded the acceptable threshold level in 3 of the 10 years on the conventionally tilled plots, but they never exceeded the threshold on the strip-tilled plots. Scientists predict that climatic changes could bring 20 percent more days each year with at least 1 inch of rainfall in many areas of the Southeast, including Georgia, Endale says. If that happens, the study’s results indicate major negative impacts: Only 1 percent of the days during the course of the study had 2 inches or more of rainfall, but that 1 percent caused 45 percent of the runoff. The researchers also found that the benefits of strip tillage, with respect to erosion and surface runoff reduction, are enhanced with cover crops. “The cover crops provide a kind of protective mat that reduces the impact of the rain as it falls on the soil,” Endale says.—By Dennis O’Brien, Agricultural Research Service Information Staff. “Strip Tillage and Cover Crops Enhance Soil Quality” was published in the November 2015 issue of AgResearch Magazine. Soil erosion is a major issue in the southeastern United States. Changing climate patterns threaten to bring more severe storms and erode and degrade the quality of more southeastern soils. Strip tillage and cover crops are keys to protecting and improving soil quality in the face of expected climatic changes.